So I know what you might be thinking. How does one get brunch at a place that doesn’t have a “brunch menu”? At a place that doesn’t put itself out there to be a brunch place? Don’t you need a poached egg? Or, is the standard a Bloody Mary and Mimosa option? I believe that the spirit of brunch is a meal that encompasses the late breakfast and early lunch time frame. It’s also a state of mind. It’s the place you can go after a great Saturday night for a fun meal later in the day on Sunday. 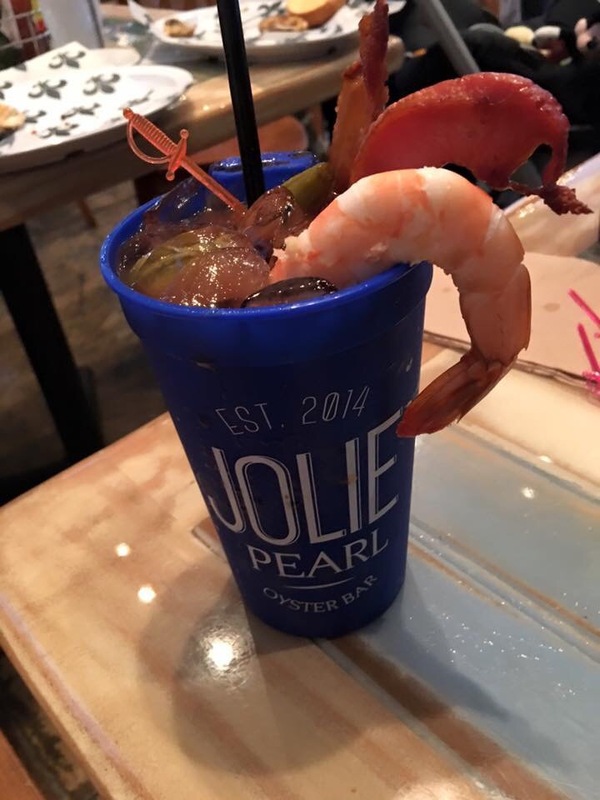 Does it need to have an awesome Bloody Mary where you can add oysters, boiled shrimp, or bacon? That certainly doesn’t hurt! But to me, brunch is again a frame of mind. Brunch doesn’t have to be overly decadent, but decadence never hurts! There doesn’t need to be a poached egg. What there needs to be is a relaxed friendly atmosphere that embraces a celebration of the weekend, knowing that, like all things, it is slowly coming to an end. Jolie Pearl, in this respect, is a favorite Baton Rouge Brunches venue. Jolie Pearl Oyster Bar is a fantastic place to get Sunday brunch. To be sure, if you don’t dig on fresh, delicious, and well shucked oysters, then this place isn’t going to be for you. Don’t go, and enjoy brunch elsewhere. 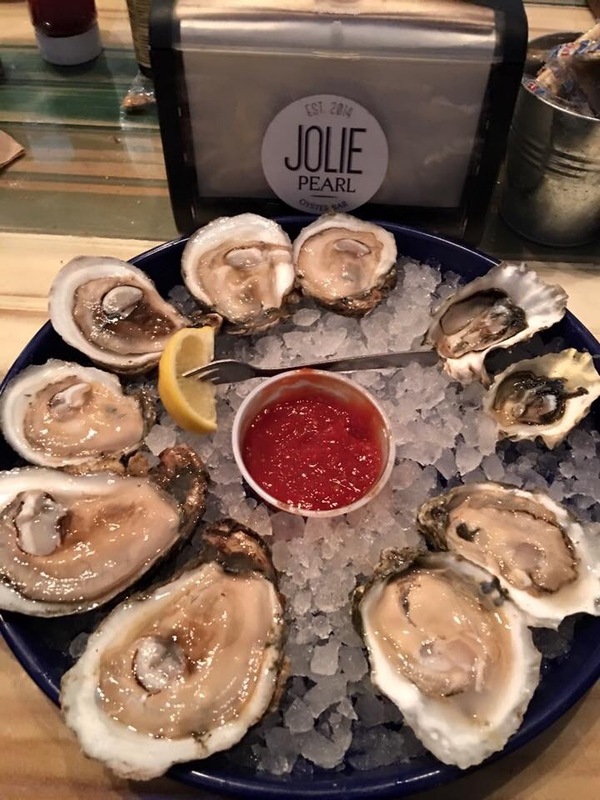 Jolie Pearl has non-oyster options like boiled shrimp, turkey, bacon and brie sandwiches, muffulettas, and Italian roast beef–but this is an OYSTER PARADISE! 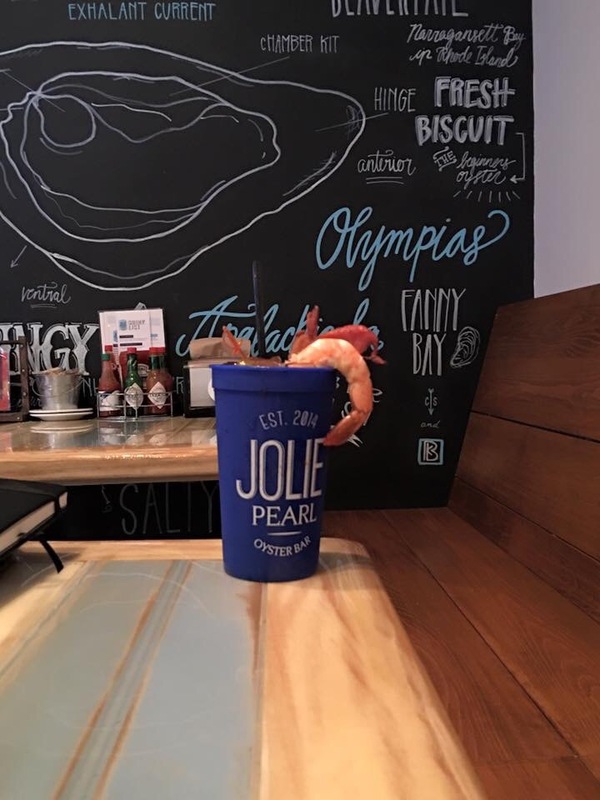 You wouldn’t go to a seafood place and order fried chicken, though I shamefully have to admit I have before–I wouldn’t recommend going to Jolie Pearl if you don’t love oysters. I love oysters, and I wanted the best in town. Jolie Pearl did not disappoint. The ambience is that of an oyster bar. There is open seating, music, and sporting events on televisions throughout the bar. There is outside seating. They are kid friendly, but you may want to leave your kids at home. They also have an interesting addition of letting you watch the kitchen grill your oyster favorites on a televised viewing are near the bar. Service is very attentive and nice. Downtown weekend parking wasn’t a problem and was close by. From a brunch beverage standpoint, the Bloody Mary Bar is solid and they don’t go light on the vodka. You can ask for bacon, shrimp, and/or an oyster to accompany your beverage. There is a great selection of spices, pickled vegetables, and hot sauces. Jolie Pearl also has a great Bottomless Mimosa for $12.00, which is a great deal and part of any good brunch. There is also a full bar if you want to go a different route. The cocktail menu is impressive. The Bloody Mary was on point. What about the oysters? The menu allows for you to get appetizers in the form of oysters served on the entire menu. 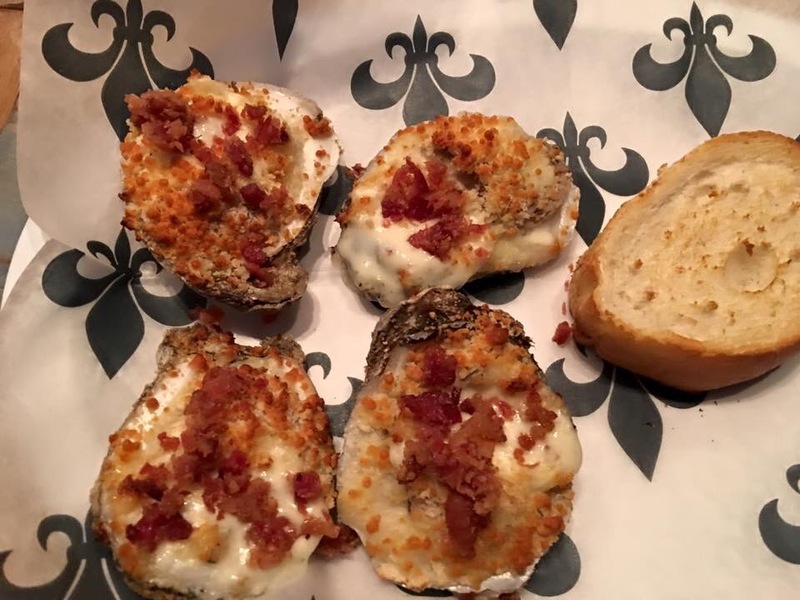 We got the grilled BBQ Nola Style oysters, the Asian style grilled oysters, and the Baked Brie and Bacon oysters for starters. You can get them in orders of 4 or 8. The Asian style are prepared in a delicious blend of ponzu and srirachi sauce – sweet and spicy, our table favorite for the grilled. The baked brie and bacon are also a great order, but know that you lose a little bit of the oyster flavor in the fantastic rich and creamy sauce. The BBQ Nola are also solid. For the oyster feast, we had to try a mix of their East coast, West coast, and Gulf coast bill of fare. There are oyster toppings (the “Bloody Mary Granita” and the “Cucumber Migonette”). Lastly, when in doubt, ask the server for guidance about the different types of East and West coast options. The servers are experienced, friendly, and are more than happy to make suggestions. 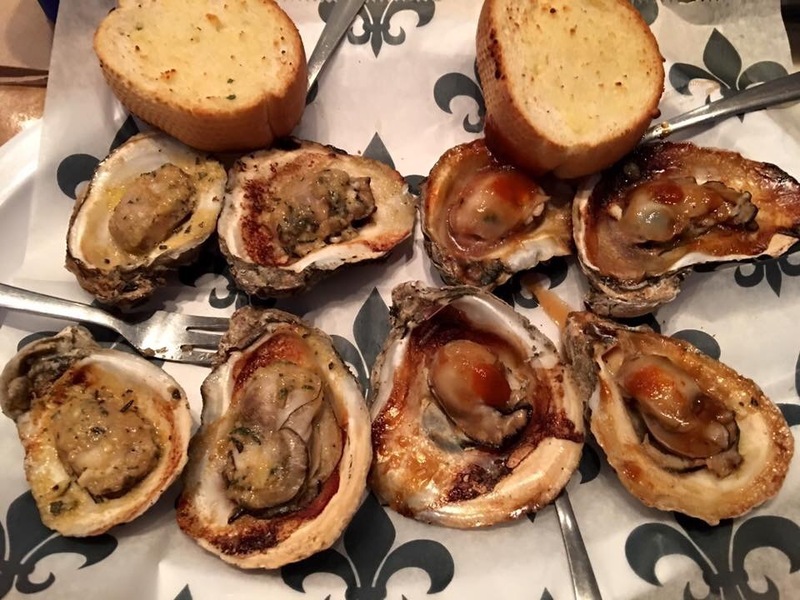 The Gulf coast oysters are perhaps the best in Baton Rouge. Perfectly shucked. They are obviously fresh and clean. There is plenty of horseradish and sauce options for you to either make your own sauce or use the house’s. They come in orders of a dozen or half dozen. There are East coast and West coast options (with specials). We got the West coast Fanny Bay and the East coast Hollywood. You can order the specials individually or in greater quantities. Each coast has an interesting and distinctive taste from its region. 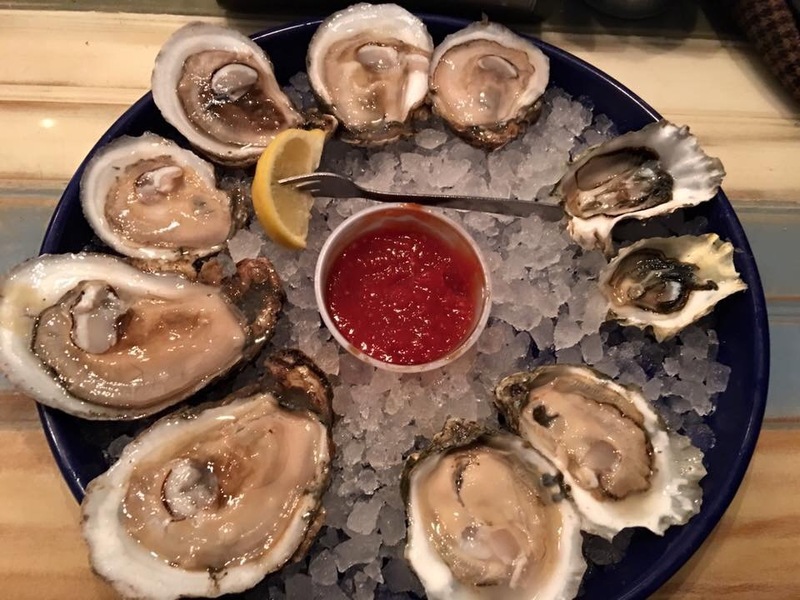 No two oysters taste alike, and they are all extremely FRESH! 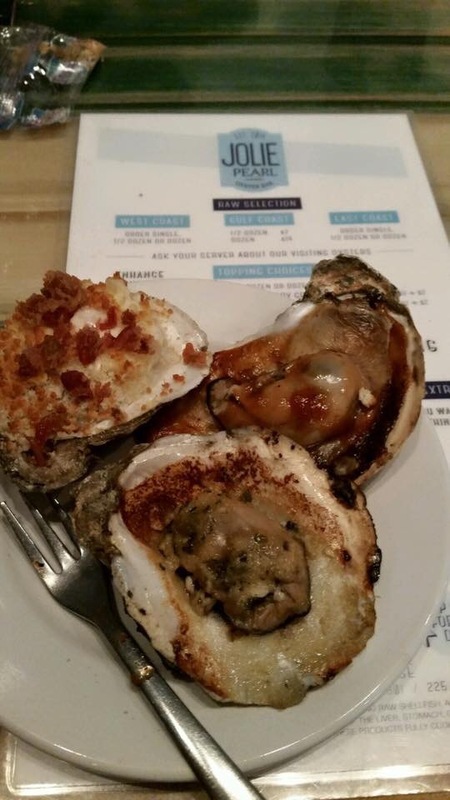 We also got Classic Chargrilled oysters, which were outstanding, and baked Bienville oysters, the table favorite of the day and, in my opinion, the Mercedes Benz of the meal. The Bienville are must haves. The oysters are traditionally baked with shrimp, mushrooms, bell peppers, white wine and bread crumbs. We had a few. The best way to approach the menu is to bring lots of friends so as to get a sample of the different types of oysters. If you don’t like a particular type, there are plenty more to choose from.